Note: Not every team makes it to the playoffs. Every athlete, though, can have a memorable senior season. Participation in high school sports is more than wins and losses. This profile on Battle Ground basketball player Shalene Talkington is also a salute to all athletes who might not have won a lot of games this winter sports season but still found a way to enjoy the journey. There is one jump ball in a high school basketball game. That’s it. A simple start to a game with both teams around a circle at mid-court and an official tossing the ball up between two players. Unless a game goes into overtime, it only happens once. Then it is forgotten. So, serious question: How many times does a team practice the jump ball before a season? 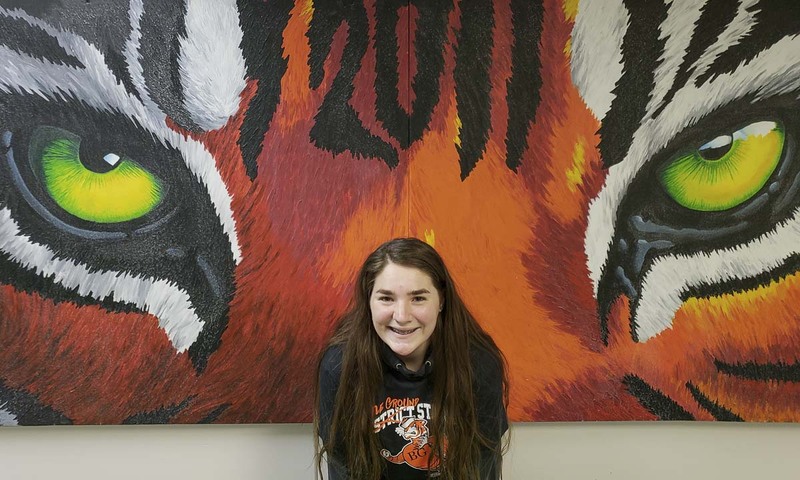 Shalene Talkington surprised herself when she was named a starter for the first competition of this past basketball season with the Battle Ground Tigers. After all, she had not played the game since she was in elementary school. She walked on the court as teammates and opponents got ready for the jump ball. Talkington paused for a second, though, a little confused. Still, if Talkington was out there for the jump ball every game, well, she must have been doing something right. Talkington followed in the footsteps of her older brother, who also played just his senior year of basketball at Battle Ground. A football star, Gunner Talkington now is a backup quarterback at Eastern Washington. Shalene is a soccer talent. As far as athletic ability, though, Shalene says she gets bragging rights in the family now. “You can put that in there,” she added to the reporter. The Battle Ground Tigers did not set the world on fire this girls basketball season. The team went 5-15 and did not qualify for the playoffs. Talkington, though, said she loved her return to the game. “I might as well do it because it’s my last year,” she reasoned. Before this basketball season, her schedule was school, soccer, homework, sleep. Repeat. Then it became “soccer, basketball, soccer, basketball, soccer, basketball, basketball,” she said. Hopefully she added school and sleep in there somewhere. She did not necessarily add recovery time, though. On Dec. 7, she broke her nose in basketball practice. The next two days, she played in five soccer matches for her club team during a showcase weekend. By Monday, she was back on the basketball court. “I can’t breathe out of this nostril still,” she said pointing to her left nostril. And she had to play both sports while wearing a mask. Her coach, Lisa May, was impressed that Talkington never missed any action after the injury. Plus, she was having fun, trying something new, something besides soccer. Oh, she loves soccer. She just wanted something different. In the process, she gained new friends. Her soccer skills helped, too. “In soccer, you have to read the field and know what’s going to happen before it happens,” she said. In basketball, she led her team in steals and was a rebounding machine. She outrebounded much taller opponents, just on instincts and a knack for the where the ball was going to go off the rim. “I got the ball, got it back to my shooters, and went in for the rebound again,” she said. Notice she did not say she attacked the hoop. “I am not a shooter,” she said, knowing her role. Shalene Talkington did not score a lot of points this basketball season. She and the Tigers did not win a lot. But she did make for more memories for her senior year. “I guess it just sounded like it would be fun,” Talkington said. That is the spirit of high school sports.